We had the MARDI GRAS JAZZBAND at FARNBOROUGH JAZZ CLUB (Kent) on Friday, 24th June 2016. They had a couple of changes to their usual line-up, giving us band leader and trombonist, ROB PEARCE, with LEIGH HENSON on trumpet &vocals, JOHN ELLMER on reeds-a-plenty, PAUL HIGGS on piano (that’s right, not green trumpet), STEVE SMITH on double bass and PAUL BAKER on drums. I said it promised to be spectacular, and it was. 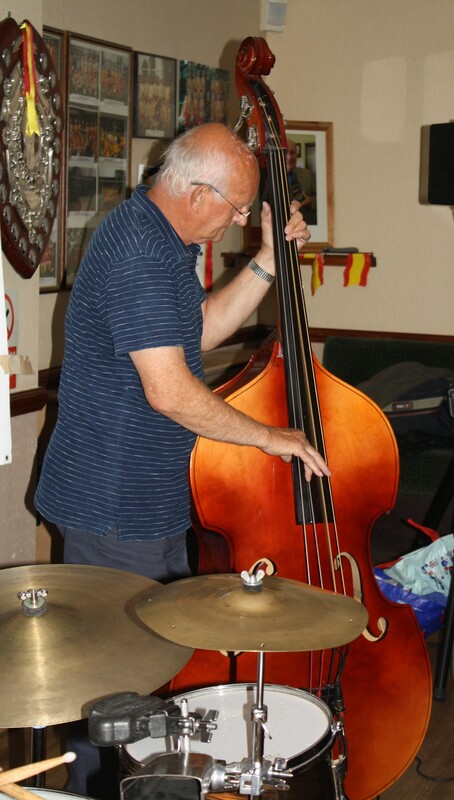 We had a lovely treat, as we also had a couple of guests, one being Pete Smith, who was drummer for Monty Sunshine. Pete is Steve Smith’s father, so they got to play with one-another, when Pete had a couple of sit-ins. The other guest was singer, Barry Vegas, yes he entertained us last time and everyone loved him, he was very professional. It was a great pity, because poor Mike, who takes photographs for us, was not with us. He had broken a rib – quite painful, so no photographs. Luckily, ‘Brown Ale’ Pete was there and took a couple, because he was ‘roadie’ with Monty Sunshine, so took a couple of Pete Smith. 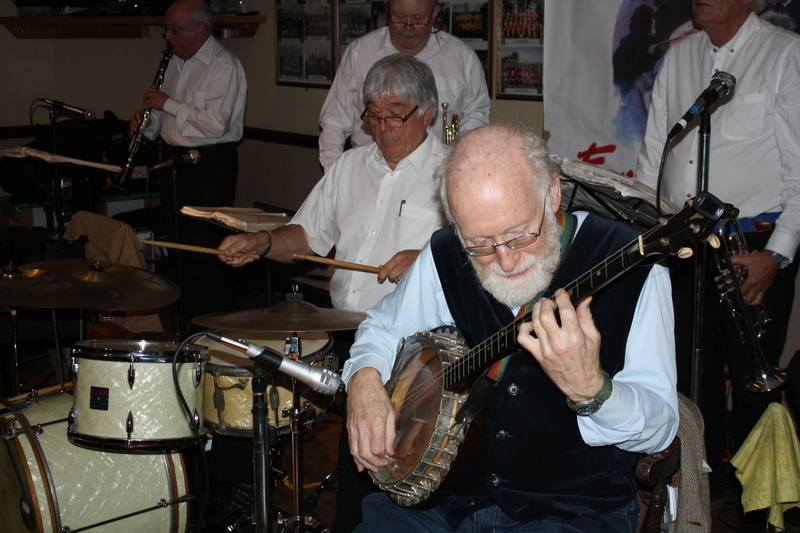 Unfortunately, the pics didn’t cover all musicians – such a pity, sorry to our two Paul’s. Steve and Pete (father and son) were only just captured together in one. [If anybody else took photos, please could you send copies to me for publishing here, thanks]. 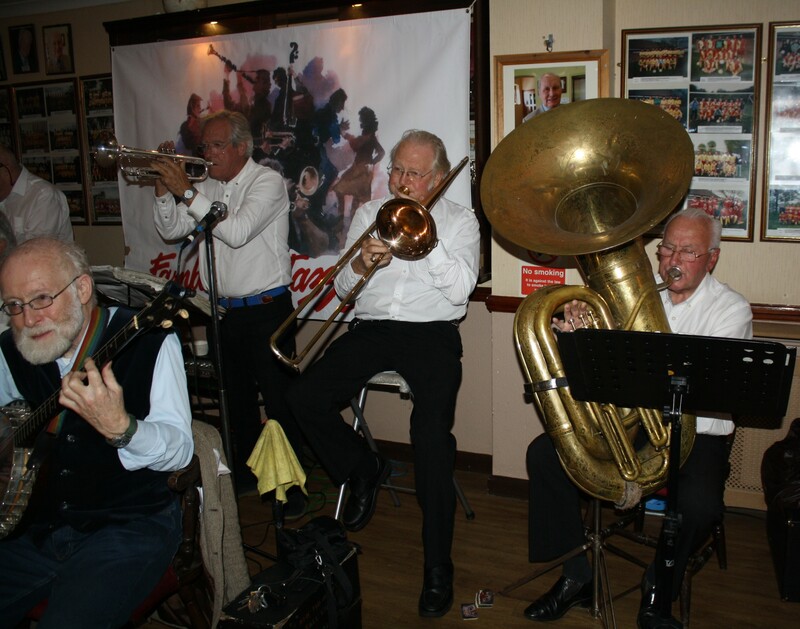 Mardi Gras JazzBand at Farnborough Jazz Club on Friday, 24th June 2016. 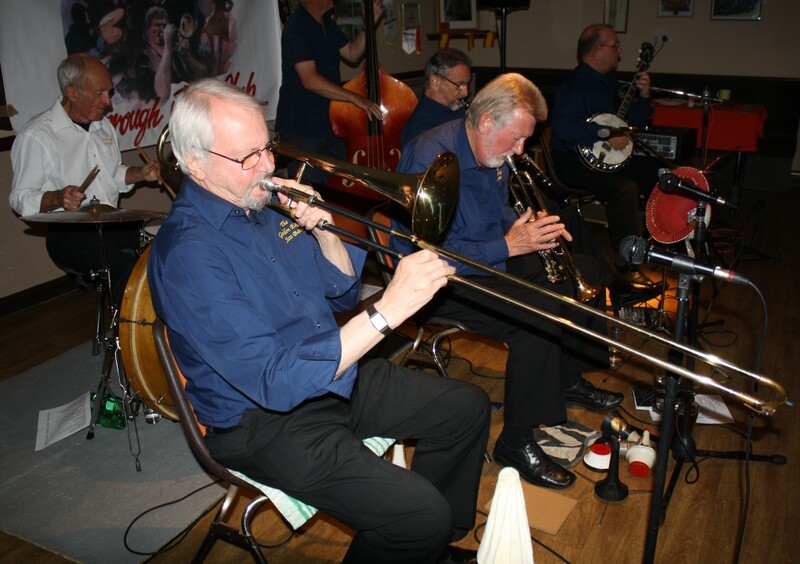 (LtoR) John Ellmer (on plenty-of-reeds), just see Steve Smith (double bass), Leigh Henson (trumpet) (Steve’s father has sit-in) Pete Smith (drums), Rob Pearce (trombone). 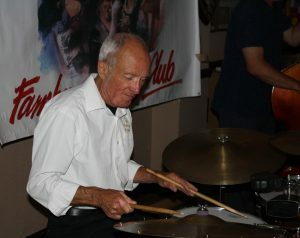 (Missed) Paul Higgs (piano) & Paul Baker (drums). Photo by Peter Marr. So here’s how the evening went anyway. 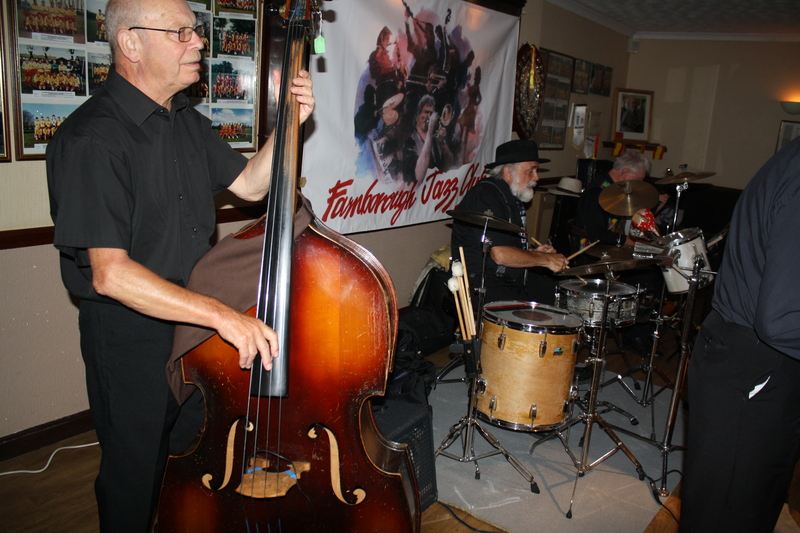 Their first two numbers were ‘Aint Misbehaving’ and ‘Darktown Strutters’ Ball’, which was sung by Rob, with fabulous solos from the two Pauls, one on piano (what a star) and one on drums (yep, another star). ‘Dinah’ is a fun number, sung by Leigh with John (playing tenor sax) singing in harmony. As for ‘St. James Infirmary’ I jotted down that John, not only sang, but played brilliant bass clarinet – I should think quite a hard instrument to play (he obviously has an enormous set of lungs). 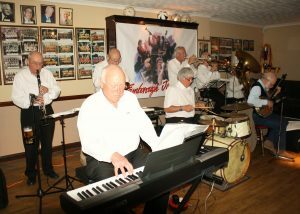 Fantastic piano from Paul, plus Rob and Leigh wonderful on trombone and trumpet. It is so hard to describe how amazing the evening was to someone who wasn’t there. It is that magic, I often speak of. They were playing their hearts out – having so much enjoyment themselves. Such a lovely bunch of guys, it’s why Keith and I will not give up until hopefully, we ‘kick the bucket’. 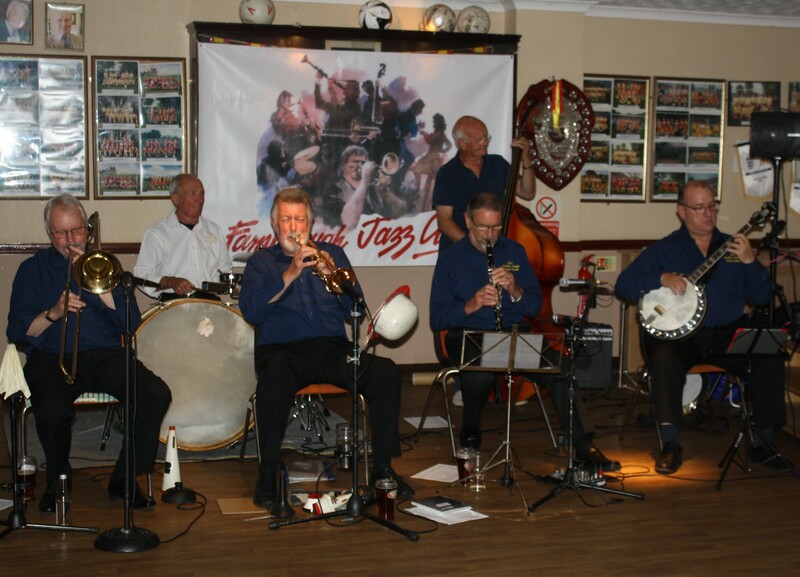 Mardi Gras JazzBand at Farnborough Jazz Club (Kent) on Friday 24th June 2016. (LtoR) John Ellmer (reeds & saxes), Leigh Henson (trumpet), Pete Smith sits in on drums (Monty Sunshine’s drummer) and band leader Rob Pearce (trombone). 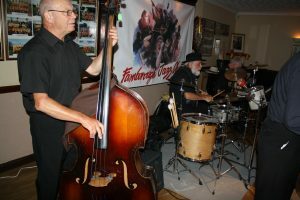 Not pictured is Paul Higgs (piano) and Paul Baker (drums) Photo by Peter Marr. 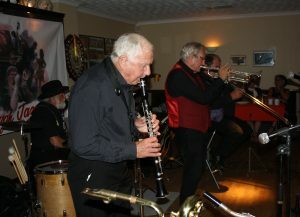 To continue … They have to play the next one, ‘Mardi Gras’ (John on clarinet this time), with Rob singing. It is so hard for me not to mention all of their numbers, such as ‘Memphis Blues’, especially because I wrote no notes, just remembered it was great. Then they invited Barry over to sing. 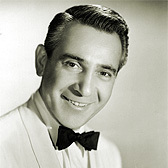 Oh what a super voice he has – I’m sure he sings at lots of high class night clubs, he’s certainly worth being booked. He sang ‘Almost Like Being In Love’ and yes we were all up dancing too. Then he sang ‘Alright, Okay, You Win’, plus others. What a great guy he is – thanks Barry. Their third set had songs such as ‘If I Had You’ – and in the middle, John played the theme song of ‘007’ and absolutely brilliantly – not only is that talent, but so full of humour – don’t you just love it. Paul also ‘replied’ and played something with the same humour, but I missed it! 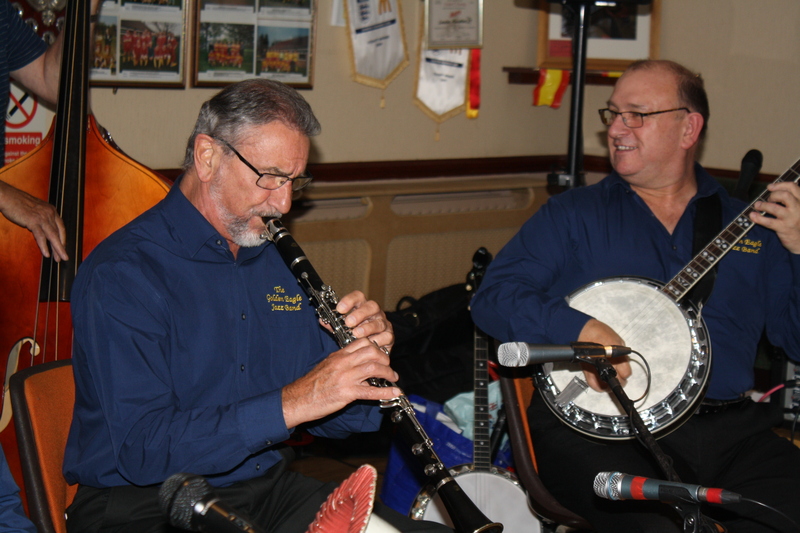 Another great tune they played with ALL of them playing just beautifully – John on bass clarinet and then clarinet to ‘Tin Roof Blues’. Then, ‘Wang Wang Blues’ (a (No.1 hit for six weeks in 1920, selling over 1million copies and winning a gold disc) sent us all on our way, with that Paul Whiteman number ‘swinging’ in our heads, but not before I had a terrific dance with Keith (with Keith’s legs akimbo and me having a hard time keeping up with him – I think I landed on my feet though! Mardi Gras will be back on 30th September. See you next week for Mike Barry’s XXL Band. 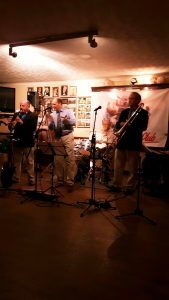 This entry was posted in Mardi Gras JazzBand on June 28, 2016 by Diane. (LtoR) Girl unknow, Diane (just behind Leslie), Keith Grant, Elaine Dunnell (landlady of Bull Hotel, Wrotham, Kent) and Ann-Marie (her young daughter, sporting a fun hat). 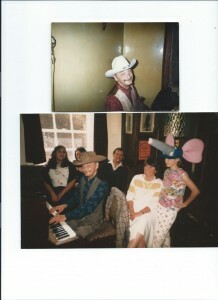 circa 1985, (Leslie played every Sunday lunchtime – sometime with Keith on drums). This entry was posted in Uncategorized on June 23, 2016 by Diane. 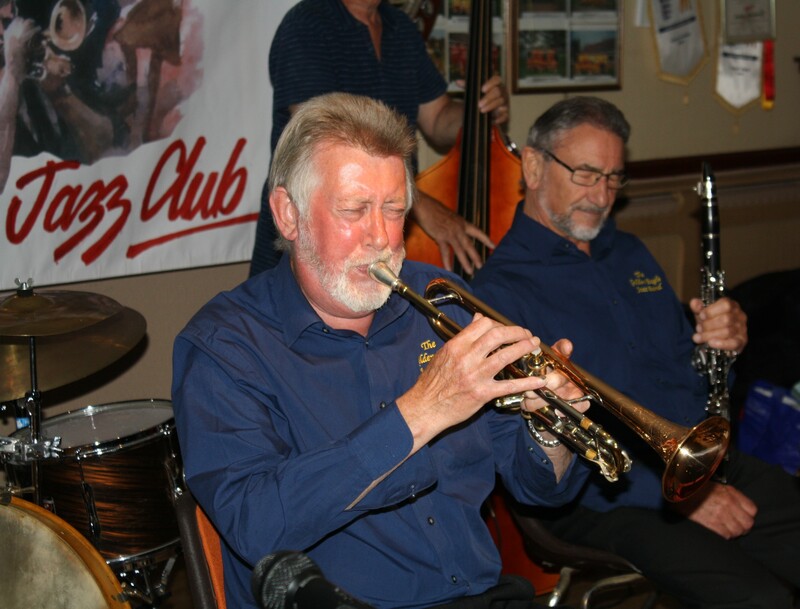 Everyone here at our Jazz Club send heartiest congratulations to The Farnborough Guild, for being promoted into the Kent Premiership League, such a feat – well done! (see the trophy on the wall – being given a trumpet fanfare). We will certainly do our bit at helping to raise funds towards the £7,000 required to meet the cost of the demands, allowing you the promotion the team has earned. This entry was posted in Uncategorized on June 4, 2016 by Diane. ‘International Needs’ is a great organisation devoted to reducing the effects of disease and poverty on families around the world. 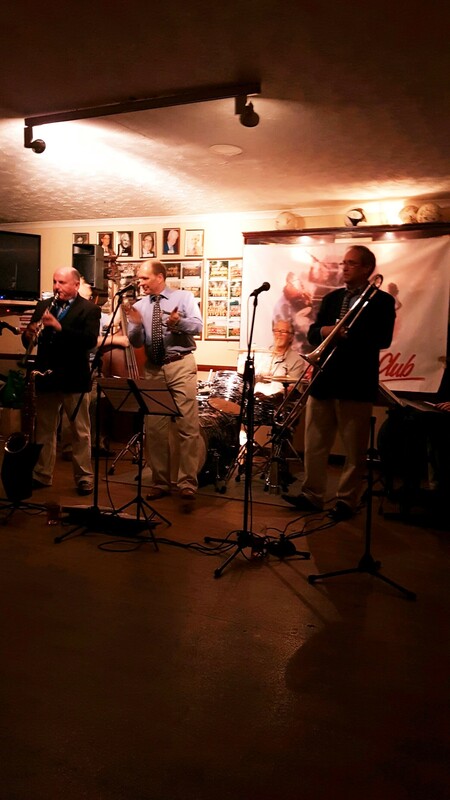 This is a very high class jazz band in a wonderful setting and would be a good opportunity to bring your friends. The under-cover seats might be the best option although sitting on the grass either on rugs or your own chairs is also possible. Tickets are available on line as well as on the door. Rows A to D on the centre section are both seated and covered, as are the other 2 seated sections. Rows E & F in the centre section are not under cover. There is a further area for people to bring rugs and their own chairs on to the grass. I believe the price of the seated tickets has been reduced but I am not absolutely sure. It’s worth checking. 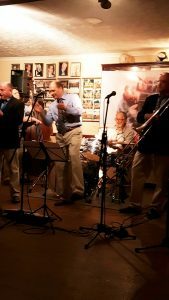 Oh what a fabulous evening with the ‘YERBA BUENA CELEBRATION JAZZ BAND’ here at Farnborough Jazz Club on Friday, 3rd June 2016. I mentioned they are an 8-pce jazz band, reflecting the great ‘Lu Watters’ Yerba Buena Jazz Band. They were brilliant, sounding like a big band. 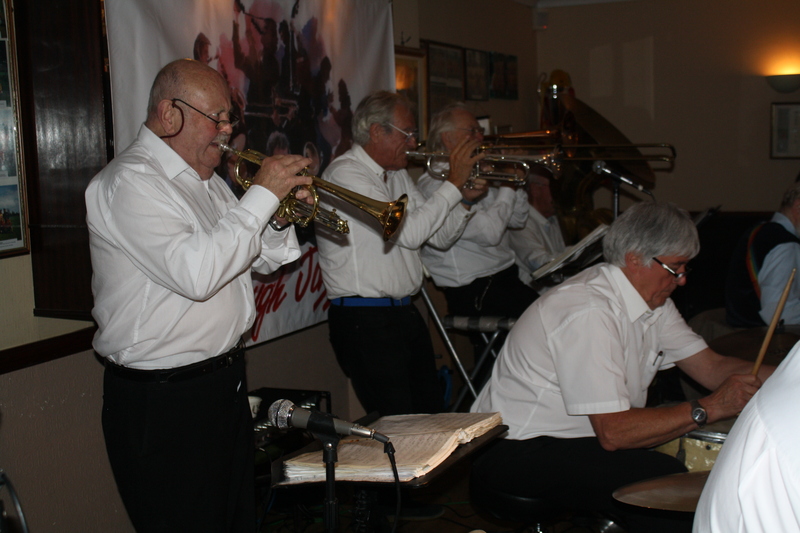 DAVE RANCE was on 1st trumpet (plus sang), MIKE BARRY was 2nd trumpet (who also sang), BRIAN WHITE on clarinet, GEORGE ‘KID’ TIDIMAN on trombone (‘Kid’ was in their original band), HUGH CROZIER on piano, PETE LAY on drums, JOHN ARTHY on tuba and NICK SINGER played banjo. Yerba Buena Celebration Jazz Band at Farnborough Jazz Club (Kent) on 3rd June 2016. 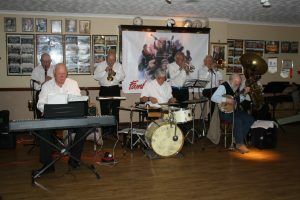 (LtoR) Brian White (clarinet), Hugh Crozier (piano), Mike Barry (2nd trumpet&vocals), Pete Lay (drums), Dave Rance (1st trumpet&vocals), George ‘Kid’ Tidiman (trombone), Nick Singer (banjo &vocals) & John Arthy (tuba). Photo by Mike Witt. They are known produce great dancing tempos and so not really surprising that both our visiting dancing couples (Linda & John, plus Jane &Alan) turned up together. As I suspected, they knew one-another from visiting many clubs. I’m pretty sure they thoroughly enjoyed themselves, as well as entertaining us with their dancing too. In fact the dance floor was packed with everyone enjoyed themselves, not forgetting the ‘listeners’. Now to enlighten you of the tunes they chose to play. Yerba Buena Celebration Jazz Band at Farnborough Jazz Club (Kent) on 3rd June 2016. 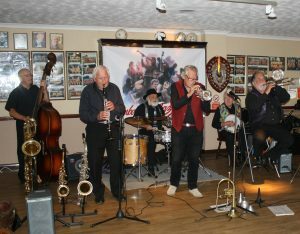 (LtoR) Brian White (clarinet), Mike Barry (2nd trumpet &vocals), Pete Lay (drums), Nick Singer (banjo &vocals) and Dave Rance (1st trumpet &vocals). Photo by Mike Witt. Yerba Buena Celebration Jazz Band at Farnborough Jazz Club (Kent) on 3rd June 2016. 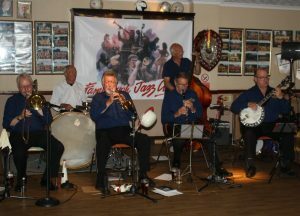 (LtoR) Nick Singer (banjo &vocals), Pete Lay (drums), Dave Rance (1st trumpet&vocals), George ‘Kid’ Tidiman (trombone), and John Arthy (tuba). Photo by Mike Witt. Quite a selection and I wish I could list them all, but that wouldn’t be fair to the band. 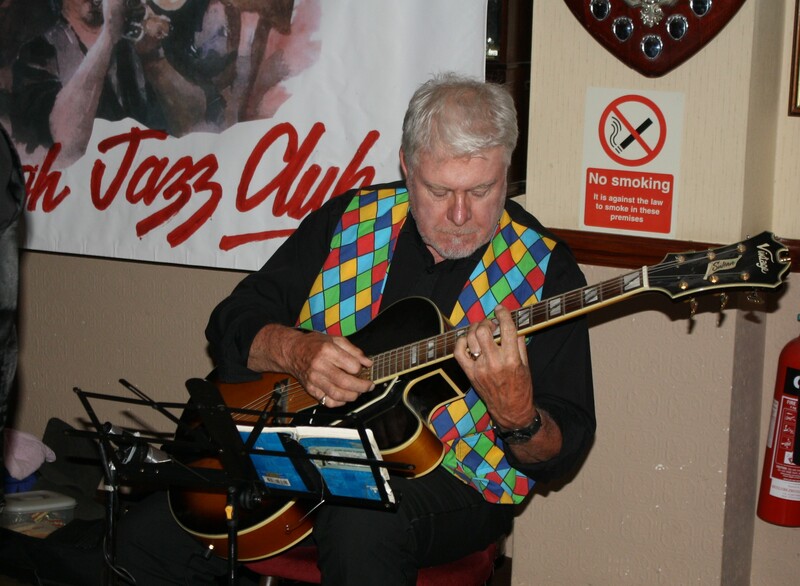 I had put ticks next to so many numbers, so it’s terribly hard to choose, but my first number to quote is ‘Blues My Naughty Sweetie Gives To Me’, sung by Dave (great voice). 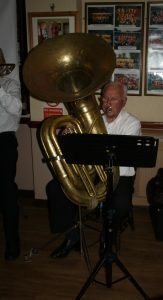 They were all playing brilliantly and I knew we were in for a fantastic evening. It was followed by ‘Muscrat Ramble’, to which I had put four ‘ticks’ against (in my notes), because wowie! 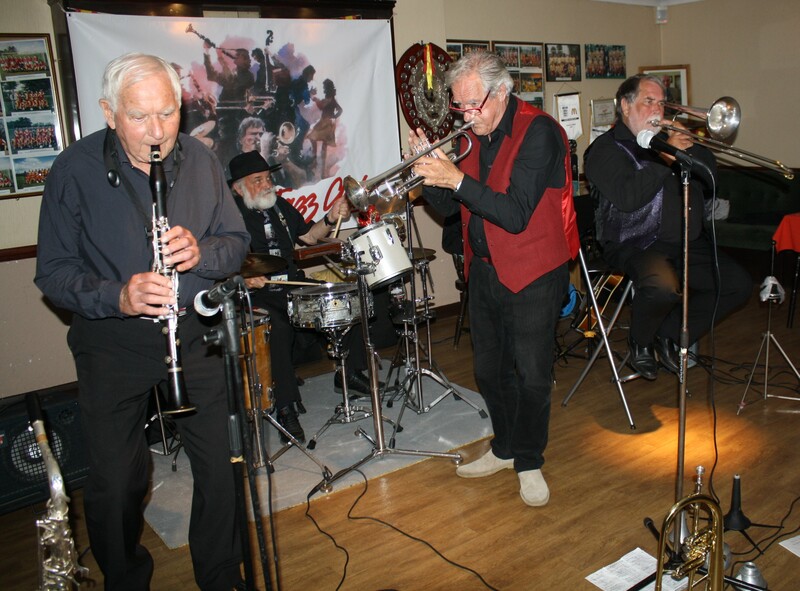 They followed on with the wonderful ‘Chimes Blues’, always a favourite and then a superb number that I don’t believe has been played here before, ‘Big Bear Stomp’. 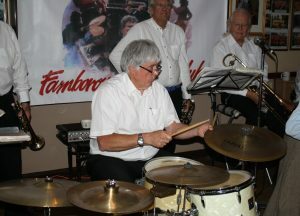 Again they were all marvellous, what a sound, I have to make mention to Pete on drums, it was one of those tunes. 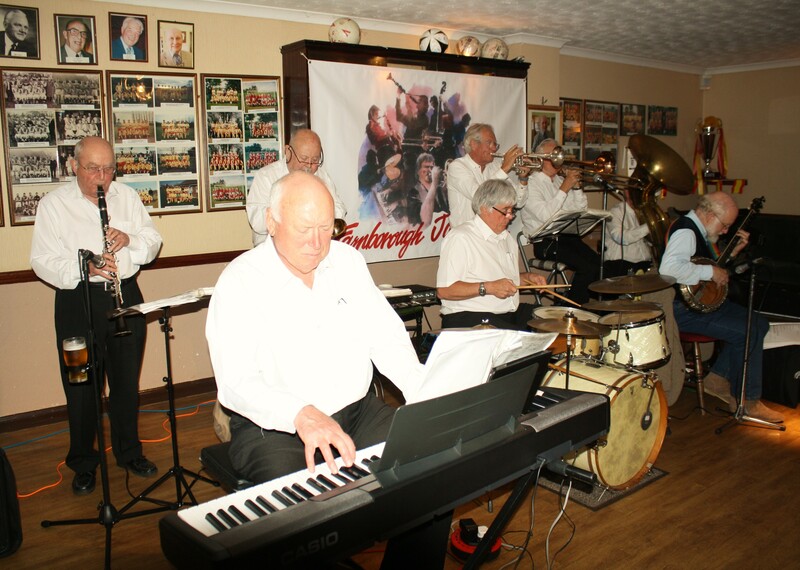 We performed our ‘Charleston’ line-dance to their next number, ‘Irish Black Bottom’, the biggest line-up thus far – twelve in all, not many for the big clubs, but lots for us! Nick took a turn to sing next – he also has a great voice and sang ‘Oh Daddy Blues’. Then came a marvellous favourite of mine, Irvin Berlin’s ‘When The Midnight Choo Choo Leaves for Alabam’. Such another great dancing number and we took advantage of that – dance floor full! 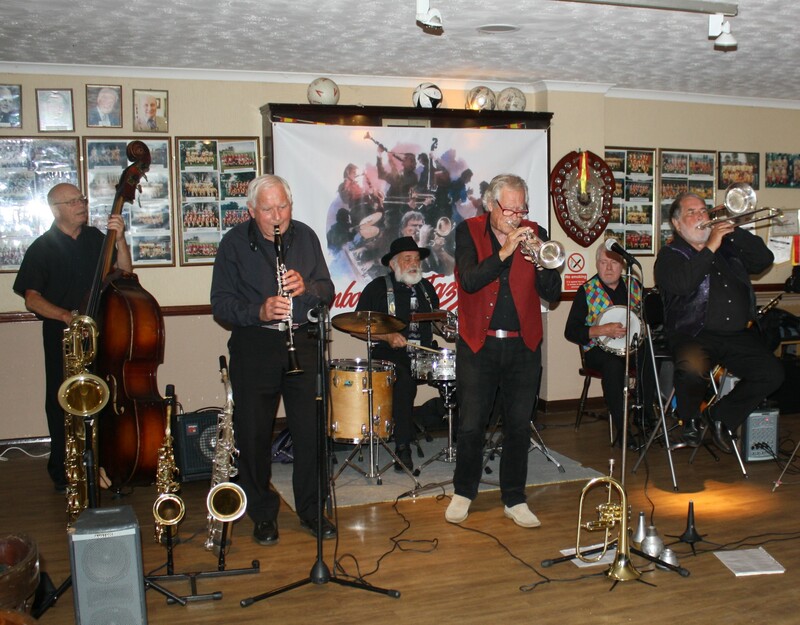 Yerba Buena Celebration Jazz Band at Farnborough Jazz Club (Kent) on 3rd June 2016. 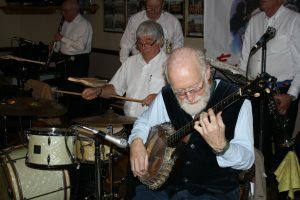 (LtoR) Brian White (clarinet), Hugh Crozier (piano), Mike Barry (2nd trumpet &vocals), Pete Lay (drums), Dave Rance (1st trumpet &vocals), George ‘Kid’ Tidiman (trombone), John Arthy (tuba) & Nick Singer (banjo &vocals). Photo by Mike Witt. 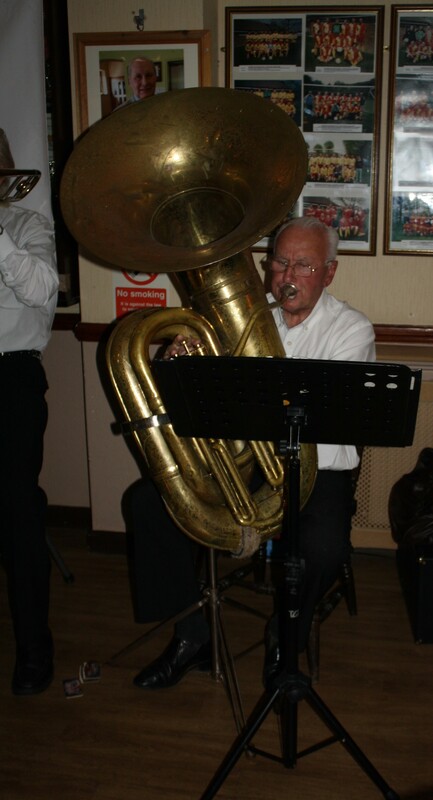 As his face is obscure from main photos, here’s one (on his own) of John Arthy playing tuba for the ‘Yerba Buena Celebration Jazz Band’ at Farnborough Jazz Club (Kent), on 3rd June 2016. Photo by Mike Witt. This entry was posted in Yerba Buena Celebration Jazz Band on June 4, 2016 by Diane.